This is a post for the development specialists amongst you and to reassure everyone else that we are making progress and doing a really thorough job on the design of the pilot. This is the pilot on a single sheet. There is a logic to it. 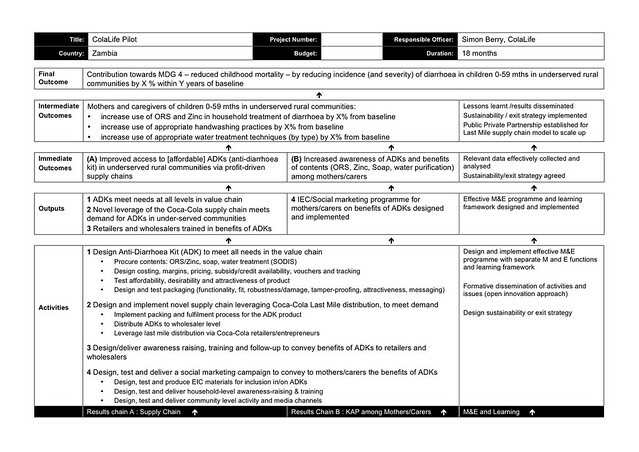 Read it from the bottom up and ask yourself if the activities described will produce the outputs we need and if the outputs will contribute the outcomes. I’ve reported on the project logic before. This is about the sixth iteration of this. Jane has been leading on this work from the ColaLife end and we are grateful to the staff at UNICEF in Zambia for their guidance and to our research adviser, Rohit Ramchandani, for his input. 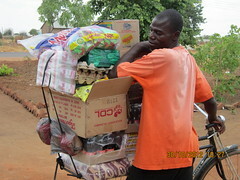 One of the principles of ColaLife is local determination. That is to say, that ‘we’ should not dictate how the ColaLife idea should be used in a particular locality. It must be up to the local health infrastructure (people and systems) to decide because they have the long term responsibility for public health not ‘us’. 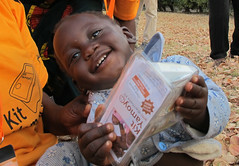 We have visited Zambia to listen to people there and they want to test the ColaLife idea to distribute ready-made ORS. The current policy in Zambia is to promote ORS as a ready-made up product and they have done a good job of doing this. Awareness levels of ORS are high. These ORT recommendations will be part of the educational materials and the face-to-face activities that will be part of the pilot.